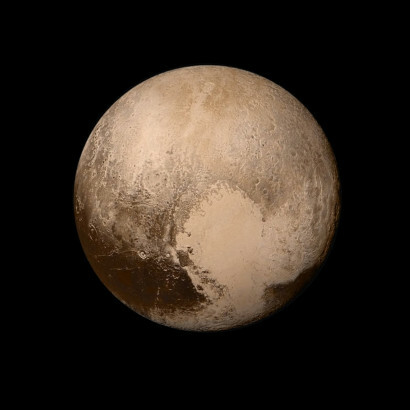 This image of the distant dwarf planet Pluto taken by NASA's Hubble Space Telescope showed an icy and dark molasses-colored, mottled world that undergoes seasonal changes in its surface color and brightness. These changes are most likely the result of surface ices sublimating on the sunlit pole and then refreezing on the other pole as the dwarf planet heads into the next phase of its 248-year-long seasonal cycle. The dramatic change in color apparently took place in a two-year period, from 2000 to 2002. The Hubble pictures underscore that Pluto is not simply a ball of ice and rock but a dynamic world that undergoes dramatic atmospheric changes. These are driven by seasonal changes that are as much propelled by the planet's 248-year elliptical orbit as its axial tilt, unlike Earth where the tilt alone drives seasons. The seasons are very asymmetric because of Pluto's elliptical orbit. Spring transitions to polar summer quickly in the northern hemisphere because Pluto is moving faster along its orbit when it is closer to the Sun. In 2015, four new images from New Horizons Long Range Reconnaissance Imager (LORRI) were combined with color data from the Ralph instrument to create this sharper global view of Pluto. The images, taken when the spacecraft was 280,000 miles away from Pluto, and show features as small as 1.4 miles.